Description: A dove-sized, secretive, long-billed, chunky bird with relatively short, gray to greenish legs, Wilson’s Snipe have pointed wings and rust on the tail. They have a dark brown striped appearance from above. The brown breast is striped and barred and the underparts are white. Snipe are commonly found in fresh and saltwater marshes and flooded fields. When feeding, they “stitch” like dowitchers and Stilt Sandpipers. Snipe fly in a distinctive zigzag pattern, often erupting quite suddenly. Similar Species: Dowitchers do not have the striped appearance characteristic of snipe and have longer necks and legs. Comments: Wilson’s Snipe were formerly grouped with the Old World Common Snipe. They are one of the few species found breeding and/or wintering throughout most of North America in appropriate habitat. Males makes a peculiar sound, called winnowing, during the breeding season when they descend from high in the air and the wind rushing through the tail feathers creates the sound. 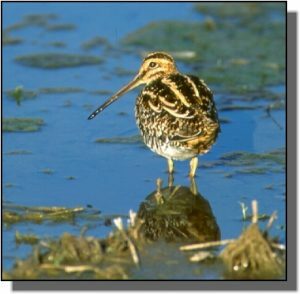 Snipe are one of two species of shorebirds legally hunted in the Great Plains.